The DJ Basin is a very large oil and gas field that stretches from Eastern Wyoming into Western Nebraska and down to Central Colorado. The primary counties for the most recent shale revolution with operators targeting the Niobrara and Codell Formations in the energy industry have been Laramie County, Wyoming. In Colorado operators are targeting Arapahoe, Boulder, Morgan & Weld Counties with the primary focus east of the town of Greeley in the Wattenburg Field. Mineral Owners should contact 1280 Royalties if they wish to sell their mineral rights in the DJ Basin. We make fast, competitive offers and work towards efficient, timely closings with our mineral owners. Take a few minutes, pick up the phone, and call 1280 Royalties today. It may be the best decision you make this year! Stop cashing those monthly checks and turn your Mineral Rights in the DJ-Basin into a lump sum cash payment today! Sell Mineral Rights in Laramie County, Wyoming. Sell Mineral Rights in Weld, Arapahoe and Morgan Counties, Colorado. The Denver Basin, sometimes also called the Julesburg Basin, Denver-Julesburg Basin (after Julesburg, Colorado), or the D-J Basin, is a geologic structural basin centered in eastern Colorado in the United States, but extending into southeast Wyoming, westernNebraska, and western Kansas. It underlies the Denver-Aurora Metropolitan Area on the eastern side of the Rocky Mountains. The basin consists of a large asymmetric syncline of Paleozoic, Mesozoic, and Cenozoic sedimentary rock layers, trending north to south along the east side of the Front Range from the vicinity of Pueblo northward into Wyoming. The basin is deepest near Denver, where it reaches a depth of approximately 13,000 ft (3900 m) below the surface. 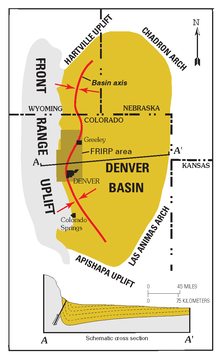 The basin is strongly asymmetric: the Dakota Sandstone outcrops in a “hog-back” ridge near Morrison a few miles west of Denver, reaches its maximum depth beneath Denver, then ascends very gradually to its eastern outcrop in central Kansas. The Dakota hogback exposes Dakota Sandstone overlying and protecting the Morrison Formationbeneath and to the west. Between Golden and Morrison, the Dakota hogback is called Dinosaur Ridge and is the site of a dinosaurtrackway and dinosaur fossils exposed in the outcrop that are part of a Colorado State Natural Area and Geological Points of Interest. The Lyons and Lykins formations outcrop in a smaller hogback. Farther west, the Fountain Formation outcrops as flatirons and forms the namesake of the Red Rocks Park and Amphitheatre. Here, against the eastern edge of the Rocky Mountains Front Range at the literal edge of the mountains, the Fountain Formation is in nonconformable contact with the Precambrian crystalline rock of the Idaho Springs Formation. The basin started forming as early as 300 million years ago, during the Colorado orogeny that created the Ancestral Rockies. Rocks formed during this time include the Fountain Formation, which is most prominently visible at Red Rocks and the Boulder Flatirons. The basin was most likely further deepened in Paleogene time, between 66 and 45 million years ago, during the Laramide orogeny that created the modern Colorado Rockies. In particular, the uplifting of the Rockies in the Front Range caused the crust near Denver to buckle downward on the eastern side, deepening the basin. The basin later became filled with sediment eroded from the Rockies. The Front Range peaks rise approximately 22,000 ft (6600 m) from the floor of the basin under Denver. The deep part of the basin near Denver became filled with Paleogene sandstone and conglomerate, a layer now called the Denver Formation. In the regions to the north and south of Denver, however, stream erosion removed the Paleogene layers, revealing the underlying Cretaceous Pierre Shale. Drilling in the Wattenberg Gas Field north of Denver. The basin itself forms a petroleum province. Oil and gas have been produced from the Denver Basin since the discovery in 1901 of oil in fractured Pierre Shale at the McKenzie Well, part of the Boulder oil field in Boulder County. 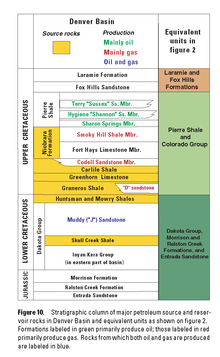 The great majority of Denver Basin oil and gas fields produce from Cretaceous sandstones, although the Permian Lyons Sandstone is also a producer. Oil has also been produced from Permian sandstones and dolomites and Pennsylvanian limestones in the Nebraska part of the basin. The Wattenberg Gas Field, one of the largest natural gas deposits in the United States, is a basin-centered gas field just north of the Denver metropolitan area. The field has produced more than 4.0 trillion cubic feet (TCF) of natural gas from the J Sandstone, Codell Sandstone,Niobrara Formation, and the Hygiene Sandstone, and Terry Sandstone members of the Pierre Shale, (all Cretaceous). In 2007, the field made 11 million barrels of oil and 170 billion cubic feet (BCF) of gas from more than 14,000 wells, making it the 9th largest source of natural gas in the United States. Biogenic natural gas is recovered from shallow gas fields (less than 3,000 feet) of the Niobrara Formation in Yuma, Phillips, andWashington counties of northeastern Colorado and Cheyenne and Sherman counties of northwestern Kansas. To date, 2,900 wells have produced 470 billion cubic feet (1.3×1010 m3) of gas. Drilling is currently very active, and the play is expanding into Perkins, Chase, and Dundy counties, Nebraska. Bituminous coal has been mined by underground methods in the Denver Basin, at Superior and Louisville, Colorado and other locations along the western edge of the basin. The coal comes from the Cretaceous Laramie Formation. Mining began in the late 1850s and stopped in 1979. Large lignite deposits are present in the Paleocene Denver Formation in the central part of the basin, in a north-south belt east of Denverand Colorado Springs, in Adams, Arapahoe, Elbert, and El Paso counties. Some mining was done from about 1886 to 1940, but was reportedly minor. The upper formations of the Denver Basin are aquifers that serve as important sources of water supply in the region. Increasing rates of water withdrawal have raised concerns about sustainability of yields from Denver Basin aquifers. Raw materials are mined from the Niobrara Formation and Pierre Shale and made into cement at the Cemex plant near Lyons, Colorado. Sand and gravel for construction are a major mineral resource in the Denver Basin. The Lyons Formation provides flagstone from quarries in Boulder and Larimer counties, along the western edge of the basin. Small amounts of gold have been mined from sands and gravels in the Denver area since the Pikes Peak Gold Rush of 1858. Some sand and gravel pits still recover gold in their washing operations. A small amount of uranium ore has been mined from the Dakota Sandstone at Morrison, Colorado, where the sandstone is impregnated with petroleum. Uranium is known to exist in roll-front type deposits in the Denver Basin, but the basin has never been a major source of uranium. Jump up^ Colorado Oil and Gas Conservation Commission Retrieved 8 December 2008. Jump up^ US Energy Information Administration, Top 100 oil and gas fields, PDF file, retrieved 18 February 2009. Jump up^ Peggy Williams, Shallow DJ gas, Oil and Gas Investor, Mar. 2007, p.51-54. Jump up^ Paul E. Soister (1978) Geologic setting of coal in the Denver Basin, in Energy Resources of the Denver Basin, Denver: Rocky Mountain Association of Geologists, p.153-159. Jump up^ D. Keith Murray (1980) Coal in Colorado, in Colorado Geology, Denver: Rocky Mountain Association of Geologists, p.210-211. Jump up^ Robert J. Wright and Donald L. Everhart (1960) Uranium, in Mineral Resources of Colorado First Sequel, Denver: Colorado Mineral Resources Board, p.363. Jump up^ Louis J. O’Connor and Bruce D. Smith (1978) Magnetic and electrical study of a roll-front uranium deposit in the Denver Basin, Colorado, in Energy Resources of the Denver Basin, Denver:Rocky Mountain Association of Geologists, p.153-159. Roadside Geology of Colorado, Halka Chronic, Mountain Press Publishing Company, Missoula, Montana (1980). This page was last modified on 24 January 2015, at 15:34. The Wattenberg Gas Field is a large producing area of natural gas and condensate in the Denver Basin of northeasternColorado, USA. Discovered in 1970, the field was one of the first places where massive hydraulic fracturing was performed routinely and successfully on thousands of wells. The field now covers more than 2,000 square miles between the cities of Denver and Greeley, and includes more than 20,000 wells producing from a number of Cretaceous formations. The bulk of the field is in Weld County, but it extends into Adams, Boulder, Broomfield, Denver, and Larimer Counties. 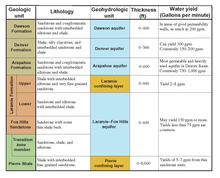 Stratigraphic column of the Wattenberg Gas Field. Oil and gas producing zones are in green; hydrocarbon source beds are in purple. East-West cross-section through the Denver Basin. The Wattenberg basin-centered field is shown in red. The reservoir rocks are Cretaceous sandstones, shales, and limestones deposited under marine conditions in the Western Interior Seaway. The gas and condensate is contained within Cretaceous formations in the deepest part of the Denver Basin, where the rocks were subject to enough heat and pressure to generate oil and gas from organic material in the rock. The field is a stratigraphic trap, basin-centered gas field. Most of the gas-producing formations are considered tight gas, having low natural permeability. Although the field today is in the deepest part of the basin, an unconformity at the base of the Pierre Shale shows that the field is on an early paleohigh active in the Middle Cretaceous. Drilling in the Wattenberg Gas Field north of Denver, 2005. Although numerous wells had drilled through the Wattenberg Field over the decades, and many drillers and wellsite geologists noticed gas “shows” (indications) in the J Sandstone and other strata, the J Sandstone and other gas-bearing formations had permeability too low to yield gas in commercial quantities, and all the wells were dry holes. Amoco geologist Pete Matuszczak noticed that all the wells drilled over a large area recorded noncommercial gas shows, with no water, through the J Sandsone (also called the Muddy Sandstone) on the mudlogs, cores, and drillstem tests. He suggested that the area might be made to produce large economic quantities if the wells were treated with the new method of massive hydraulic fracturing, which Amoco was using successfully in the San Juan Basin of New Mexico. Drilling started in 1970, and were completed in the J Sandstone, at depths from 7350 to 8500 feet. Drilling deep gas also fortuitously found conventional oil in places in the shallower Terry and Hygiene sandstones. The D Sandstone, another conventional reservoir, also produces in limited areas within Wattenberg. Additional producing formations were added to the field. Starting in 1981, operators discovered that the Codell Sandstone would yield economic quantities of oil and gas if hydraulically fractured. Hundreds of new wells were drilled and completed in the Codell in the early 1980s; the Codell was often co-completed with the overlying Niobrara Formation. Additional wells were drilled and hydraulically fractured in the Plainview and Lytle formations, below the J Sandstone. The initial spacing of one J Sandstone well per 320 acres was found insufficient to drain the reservoir, so the Colorado Oil and Gas Conservation Commission approved infill wells. Gas wells in Wattenberg were drilled vertically until 2009, when operators discovered that horizontal wells drilled in the chalk of the Niobrara Formation yielded better quantities of gas and condensate, setting off a new round of drilling. In 1973, the field was thought to contain 1.1 trillion cubic feet of gas. Through 2008, the Wattenberg Field had produced 2.8 trillion cubic feet of gas. In 2009, the US Energy Information Administration listed Wattenberg as the 10th largest gas field in the US in terms of remaining proved gas reserves, 13th in remaining proved oil/condensate reserves. As of 2008, an estimated 5.2 trillion cubic feet of recoverable gas remains recoverable. In February 2013, the field produced more than 740 million cubic feet of gas and 100,000 barrels of oil per day, from more than 22,000 active wells. Major operators in the field include Noble Energy, Anadarko Petroleum Corporation, and Encana. Jump up^ R.J. Weimer and S.A. Sonnenberg, “Wattenberg field, paleostructure-stratigraphic trap, Denver Basin, Colorado,” Oil & Gas Journal, 22 Mar. 1982, p.204-210. Jump up^ “Reinventing Wattenberg,” Oil & Gas Investor, July 2009, p.35-45. Jump up^ R.A. Matuszczak, “Wattenberg Field, Denver Basin, Colorado,” The Mountain Geologist, July 1973, v.10 n.3 p.99-105. Jump up^ Sharon Dunn, “Colorado’s Wattenberg growing in importance in oil, gas industry,” Denver Post, 13 Aug. 2012. Jump up^ American Petroleum Institute, Strategic energy resources: Denver-Julesberg Basin-Wattenberg Field, Colorado, Autumn 2008. Jump up^ US Energy Information Administration, Top 100 oil and gas fields, 2009 2010. Jump up^ Gargi Chakrabarty, “Wattenberg Field – a bottomless well?” Denver Rocky Mountain News, 18 Oct. 2008. This page was last modified on 15 January 2015, at 14:10.